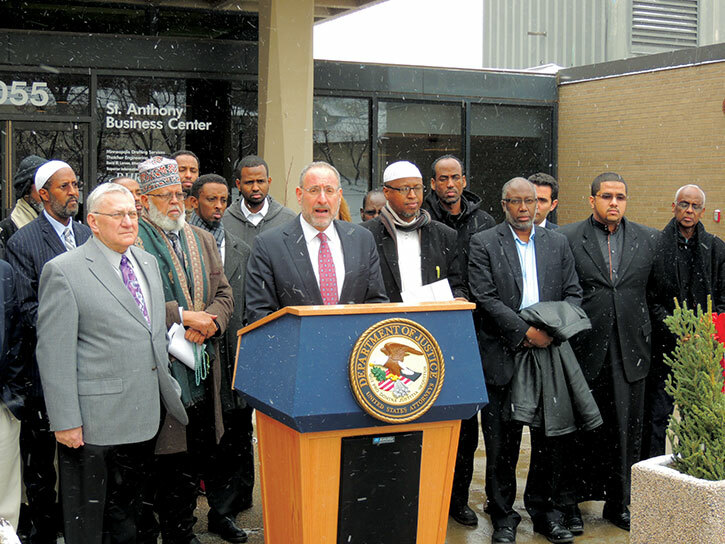 U.S. Attorney for Minnesota Andrew Luger (at podium) continues to face pushback from a large section of the Somali community in his anti-radicalization efforts. Months after U.S. Attorney Andrew Luger launched a $1 million dollar program to counter the recruitment and radicalization of young Muslims in Minnesota, tension and division still exists within the Minnesota Somali community who are the primary target of the program. A community meeting called by Mohamed Mohamed, executive director of the West Bank Community Coalition on Monday was exhibit A of the type of disquiet that still exists in the community. There still remains deep suspicion of the program, which many in the Somali community believe is an intelligence gathering operation by the federal government, despite promises to the contrary by Luger. Critics of the program in the community have likened it to COINTELPRO, an illegal and covert 1960s FBI program conducted by the FBI aimed at black civil rights leaders and organizations to surveil and undermine them. As the project evolved over the course of the year, it remained the domain of mostly Somali activists, Imams and policy experts within the community. This has changed since the September launch and the Somali community in the state has demanded wider discourse on the matter as it has gained widespread attention. Among those present at the Brian Coyle community meeting were Minneapolis State Rep. Phyllis Kahn, executive director of Somali American Parent Association Mohamed Mohamud, Jibril Afyare, a software engineer at IBM, Matthew Palombo, philosophy professor at Minneapolis Community & Technical College (MCTC), activist and freelance journalist Mel Reeves, Imam Hassan Mohamud and CAIR-MN executive director Jaylani Hussein. It was not long after a brief panel discussion about the CVE efforts in the Twin Cities that the event took a different turn. It became clear quickly that the majority of the attendees and panelists opposed the CVE pilot program. The renaming of the program from the ominous sounding Countering Violent Extremism to Building Community Resilience had done little to change minds. Mohamud, Afyare and Rep. Kahn were among the few who championed the CVE initiative. Mohamud and Afyare said that they did not work for the federal government, but were members of the Somali-American Taskforce, a community coalition composed of about 15 Somalis, including imams, activists, parents and health professionals that Luger had put together to advise on what CVE should take before its launch. Reeves was one of the many opponents who did not agree with the approach Lugar and law enforcement is taking to help vulnerable black communities. His comment, however, irked Kahn. Reeves repeatedly said that “the government should not feed and punish” reminding the crowd that “Andrew Luger locks your [Somali] kids.” His remarks provoked a testy response from Kahn who called him a liar. Reeves did not take it kindly and responded “I respect your position. Don’t call me a liar!” amid loud cheers and applause from the crowd. The crowd erupted and held their smart phones high. While people like Afyare and Mohamud believe the notion “it takes an idea to counter an idea”, MCTC professor and vice president and cofounder of Ummah project Palombo addressed his concern and the danger of the language the CVE imposes. “The issue is about the language, countering ideological violence. I don’t think about ideology as committing violence. We are diverting our way from dealing with bigger issues such as countering Islamophobia and police brutality,” he said. Professor Palombo said he had and still has reservations about CVE but still applied for funding. A local nonprofit called Youthprise was appointed by U.S. Attorney Luger to decide how the CVE grant money of more than $1 million will be distributed and which programs will get funded. Luger took the approach to channel the money through the non-profit after a spirited pushback from influential Somalis who were suspicious of government involvement in non-profit work and the fear of surveillance. Palombo laid out strategies he plans to take with his approach to counter extremism. “Our program and recommendation is to create Somali youth leaders who can mediate in their houses, workplace and schools,” he said. Mohamed Mohamud, executive director of Somali American Parent Association (SAPA) and a member of Luger’s Taskforce, was incredulous that Palombo even applied for the money. “You cannot call the program bad and apply for the money,” Mohamud said. Hussein of CAIR-MN shifted the discussion from appropriations to Minneapolis Public Schools’ plan to implement the CVE pilot program. Hussein said that the CVE pilot program is comparable to a failed “prevent program” in the United Kingdom. CVE proponents criticized and labeled Hussein’s remarks as a false rumor. Phyllis Kahn who is engaged in a reelection battle against two Somalis urged the community to soften its opposition to the program and instead take the money. “Stand up and take the money. Use the money the way you want to use it,” Kahn said. Majority of those present, however, remained unconvinced. Mahamed Salad, a youth panelist, was dismissive of CVE supporters and specifically members of the Somali-American Taskforce. Somali coalition groups are arranging a protest against the program in the coming weeks, Mshale has learnt.